Peter Pan: The Land of Forever takes place after the events of Peter Pan in Scarlet, although not a direct sequel. As things progress in our project Peter Pan:The Land of Forever we have opened up an opportunity for investors to be part of what will be a historic production. An exclusive opportunity for accredited investors is being offered through a Private Placement Memorandum. Click the link above to download and review our Electronic Press Kit. Throughout our social media sites there are teasers about the film and its characters. Feel free to check them out. DreamTeller Studio has the opportunity to capitalize on the multibillion-dollar film and merchandising industry based on the proprietary work of Francis Taylor. Francis’ story takes place after the events of the original and its sequel Peter Pan in Scarlet where Peter finds himself stranded and flightless on Neverland Island. In re-imagining an original rendition of the Peter Pan story, which has recently come into the Public Domain, Francis creates a whole new set of characters. 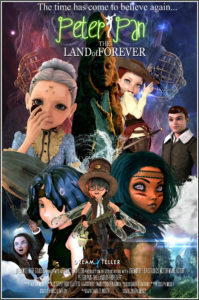 Peter Pan: The Land of Forever,is an authentic story continuing the Peter Pan saga with the introduction of a completely new set of modern day characters to the already exsisting ones. The main female characters featuring Maggy Darling (Wendy’s granddaughter) and her friends are just what parents are looking for as role models for their daughters. The male characters feature Peter and Jack learning the value of friendship. Dream Teller Studios will capitalize on both Taylor ’s creative genius and the need to provide parents with positive role models for their children, boys and girls alike, re-invigorating the millions of existing Peter Pan fans while winning legions of new fans. It will delight and entertain its audiences. PETER PAN, THE LAND OF FOREVER,brings Peter, Maggie and their friends into the 20th century while providing an exciting adventure maintaining the spirit and essence of J.M Barrie original works. What makes a film investment so special? Well, a film doesn’t need to be a large success at the box office in order for an investor to receive a return on their investment, that’s the benefit of investing in independent film. The global marketplace for film and TV programmes is growing rapidly as a result of the increasing number of platforms and media by which they can be shown. The benefits of investing in film stretch far beyond the sales of box office tickets, DVD/Blu-Ray sales, Television airings, Video on Demand (VOD) subscriptions and the sale of merchandise all count towards the profit a film makes and can continue to generate a profit for many years after a ﬁlm’s initial release. Based on our research, we expect global box office revenue from 2016 to 2020 to rise from $38.3 billion to $49.3 billion. The U.S. is the third largest film market in the world in terms of tickets sold per year, only behind China and India. We believe our story will have an international appeal far beyond most films. A ﬁlm investment allows you to be part of something much bigger than just an investment; a ﬁlm investment offers you the opportunity to be part of the next big success story and as well as high returns and a life time of earnings investing in the ﬁlm industry can also offer you a great deal of tax relief benefits. TAXATION – As tax rules are constantly changing you are strongly advised to seek independent advice on your investment.